I shearched every corner of the web, and didnt get a single tip on where could I get my greedy hands on this. Anyone knows something about this? All info is extremely apreciated. Where did you stumble across it? You sure it’s a figure? It looks seamless like a statue. Im not entirely sure, cant really tell the size. But im quite confident that the other image, the bust, is a diy kit model for painting. Yeah, the bust is just that. Here's the page that the full figure picture originated from. It's probably some kind of modeling kit from 2013 or so. It actually reminds me of the old Horizon Original vinyl kits from the mid-90's. Last edited by SpasticPlastic; 05-26-2018 at 04:38 PM.. Most likely its an unlicensed garage kit that had a super small production run. Maybe try asking around at statue forums. Also theres the off chance you can come across one on ebay. Looks like its a figure then, maybe 10-12 inches? Probably somewhere in between a model and a statue. 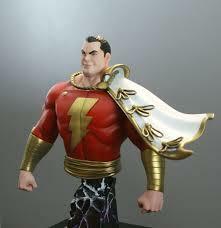 From what I can find it is a garage Kit from "Shazam! Bust painted by Don Bohm". He looks to use existing statues and custom sculpting to create his own. A little update on my quest to find this. I got in touch with mr. Bohm, he doesnt really remember where he got the bust, but he managed to tell me the name of the artist. He (the artist) only did the 3d model of the statue (and ergo, the bust) and he could sell me the model, but it is somewhat expensive for my pocket. Im still trying to find the statue depicted in the first picture tho, I think it could be cheaper if its already made from resin or other material from a model. You should try to contact Martin Connell from The Lead Covenant. He is the one that took the picture of the statue/ figure/ model at the convention. Maybe he can help? I contacted Martin Connell, the person that took the photo of the statue, and he couldnt give me any further information about it, so im right at square one. 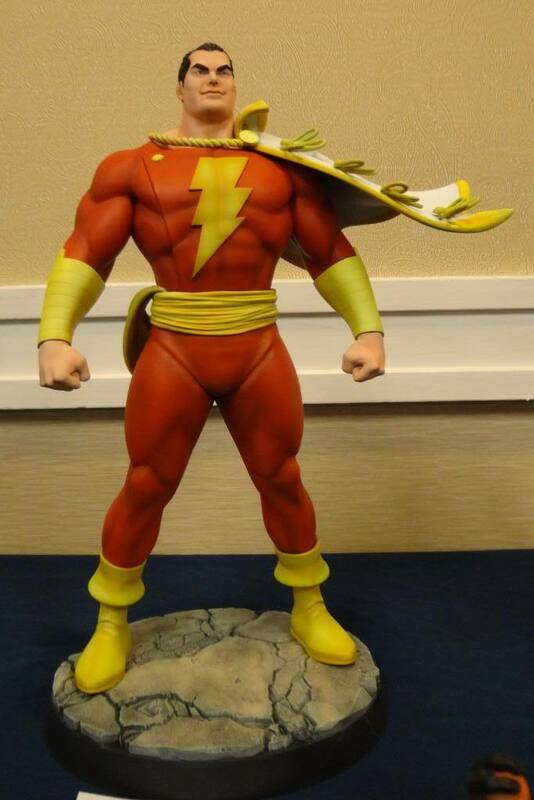 I know the digital artist, he can sell the 3D model, but the statue doesnt seem to be a 3D printed one. Thats whats eating me inside. Damn! I was hoping he would be the one to know. Since it was at a show, maybe it was just a prototype that never actually got into production. Looking at his picture, you can see the top of a title card. Wish he would have zoomed out just a teeny bit more! This lead me to the next clue. So Im guessing these guys are the manufacturers. Lets see what can they say about it. Fingers crossed.